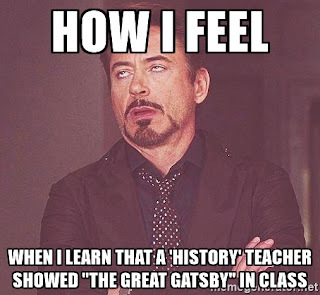 This year, the final unit in my English 11 Honors class will be The Great Gatsby. This is a special unit for me. It was the first full unit that I planned and taught as I learned Common Core State Standards. I'm really proud of it. Every year, before I teach Gatsby, I always ask for the hands of students who have already read the book. There is always a handful--some who are avid readers and read it out of interest, others who have transferred in from schools that taught it in 10th grade. I also ask who has seen the film. The first year I taught Gatsby, the Leonardo Dicaprio film was about to come out, and there was a lot of interest in students--and a lot of teaching resources available. The rule about movies is this: the longer since a release date, the fewer students will be familiar with a film. Within about six years, most films are out of the mainstream, meaning that they are new and "teachable" again. Last year, about half the class had watched the film. I was surprised, then, when 90% of the students in each of my two honors classes raised their hands when I asked about the movie. They told me that three American history teachers at our school had chosen to show the entire film to their classes as part of a unit on the 1920s. ["It's in our standards!" was the explanation. ]* Needless to say, in three previous years of teaching the book, I had never shown the class the whole film. I had to decide--on the day I started the Gatsby unit, no less. 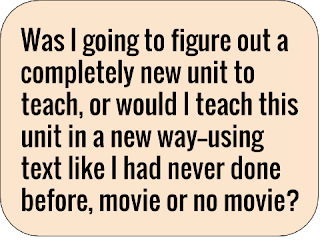 Was I going to figure out a completely new unit to teach, or would I teach this unit in a a new way--using text like I had never done before, movie or no movie? It would be a challenge. It was one that I was up to, I believed. The result of this plan will fill several blog posts from here on out, as this blog is intended to share what I have learned "out loud." 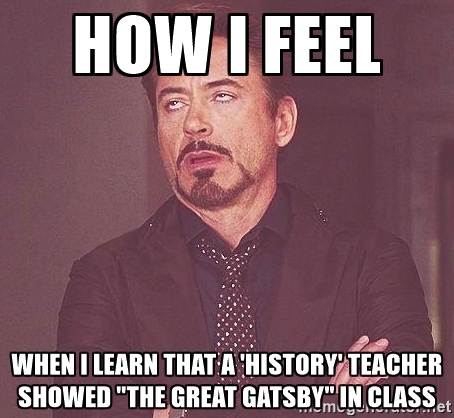 I usually start Gatsby--or any book-length text--by reading the first two pages out loud with students, then asking an open-ended question. I have had great discussions in recent years using the question, "Who is the speaker in Gatsby?" (RL 11.6). If personality is an unbroken series of successful gestures, then there was something gorgeous about him, some heightened sensitivity to the promises of life, as if he were related to one of those intricate machines that register earthquakes ten thousand miles away (2). I asked students, "What does the speaker mean when he uses the word, "gorgeous"? Use evidence from the opening pages in your response." Students got right to work. This sentence isn't used in the film at all. They were engaged. There were no complaints. I had survived my first lesson after having the former lesson taken away from me by the history department. There were many challenges ahead. Approaching our first quiz last Thursday, I knew I would have to change up the questions. I use quizzes to monitor who is reading the assigned passages, and who needs encouragement to do so. Usually there is a fair share of basic plot questions to assess. Those questions were now out the window. I needed more text-based questions and fewer questions that a classtime view of the movie might provide. I went straight to the text, finding places where I had used "plot" questions, and replacing then with "text" questions from the same point. 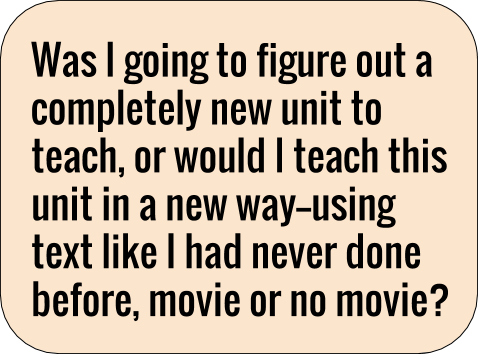 Some were still "gotcha," and my second quiz is by no means a perfect quiz, but it represents my evolution as a text-based teacher. The results of the new, text-based quiz. Overall, scores were higher. A small part of that may be because so many had seen the movie, but I'd like to think that familiarity with the text really helped more. Also, the low, "unread" scores were much lower: two or three out of ten, whereas in the past there may have been five or sixes out of ten. Still, I'm always up for a challenge. I have several hours of extra work to perform over the final three weeks--new quizzes, a completely new culminating assessment, new supplemental texts--that I didn't expect to have to do. But this challenge also makes it possible that I will be a better teacher as a result--just as teaching Gatsby back in 2013 opened me to a new work and helped me to implement Common Core in my classroom. This semester's Gatsby isn't a retread of past great lessons. For good and for bad, it is totally new. 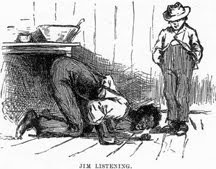 Hughes; excerpts from Crusade for Justice:The Autobiography of Ida B.Wells, Ida B.Wells."